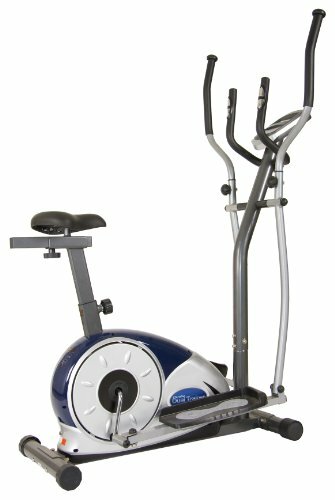 Body Champ BRM3671 is a fitness trainer that can be conveniently used as a stationary bike and an elliptical trainer. This Dual Trainer will prove to be surprise for you when you compare with other similarly priced machines. It works the way was meant to work. Good for average exercisers and has a seat to be used as a bicycle. Listed on Amazon for a max of 220 lbs weight for a person, but the manual lists it for 250 lbs max, which is good for workouts. It has a sturdy construction, no noise, and no wobbling. It has ten fuzzy logic controlled computerized preset programs for efficient workout. It has heart-rate based programs. The specially designed customize program will provide the best training depending on individual physique requirements. This dual trainer has a 2-way adjustable seat, due to which you will be able to customize it vertically and horizontally, and get the most comfortable position during your workout. Moreover, it has a unique adjustable seat through which you can use the machine as an elliptical trainer or a bike. Your workouts will be a dream with this elliptical machine. You will be able to easily set your own pace with the adjustable magnetic straps provided with this Trainer. The LCD electronic display allows you to monitor all of your training progress in real time. With the frame, you get a 1-year warranty with the frame and ninety days warranty for all the parts. To avail the warranty in practice, you have to make sure that the date of purchase is properly recorded during purchase. Elliptical trainer and exercise bike are combined together to make a Two-in-one design. LCD console is computerized and programmable. It has 10+ preset programs for class trainer outfits. It is a heart rate driven program to fit into the perfect workouts. To make workouts in different postures, the seats can be fiddle with vertically or horizontally. It has a 14-inch stride length and a weight capacity of 275 pounds. Each one of Body Flex’s products undergoes highly detailed and meticulous quality control. In addition, Body Flex extensively monitors the shipment and delivery of its products to the market and stores so that you can immediately experience the benefits and enjoyment that its products offer. Body Flex is committed to providing quality that you can depend and rely on. Together with the machine you will also get instruction manual on how to use this fitness gadget. Most of people agreed that it was easy and no instructions were needed to start using the trainer. Customers built it easily without problem in installation and commissioning of the machine. Anybody can figure out how to set a program, find the calories burnt, etc. Users recognized this machine working great as both trainer and bike. A number of reviewers said that BRM3671 is so quiet, that you can always place it anywhere in your home without thinking of noise it will make – it is very silent. Do your workouts in all possible formats within the 90 days to find out wear and tear of the parts and components used in this machine. However, the BRM3671 is highly rated by almost all users. Most users give it 4 out of 5 stars. Users found it very easy to assemble within minutes, and the delivery time is surprisingly less than expected. The delivery time may be quite important for you when you want to start your workouts immediately. Most users are very pleased with the size of this elliptical machine. It does not consume much space and storage is highly comfortable. You do not require a dedicated space for this machine. The price is a vast advantage. Most other machines with the same features cost twice as much as this machine. However, not all the features are so bright; some users did not like the stride length. People over 6ft in height found it uncomfortable.